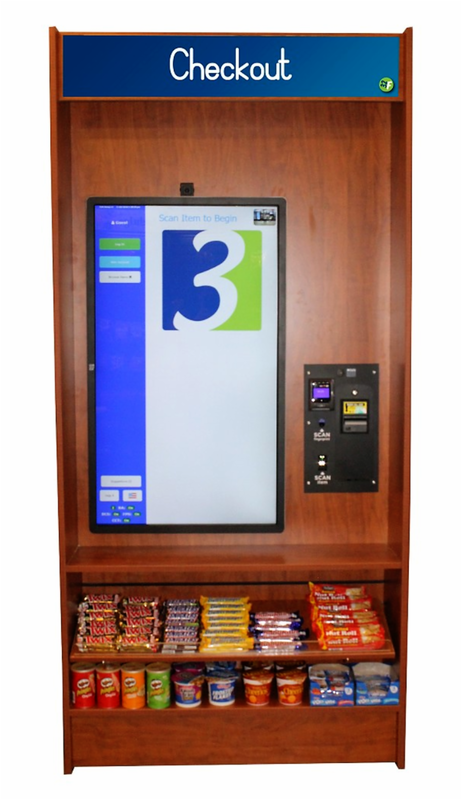 Three Square Market’s newest kiosk, “The 46,” offers a self-contained, self-checkout kiosk built into a rectangular fixture designed for smaller locations. The fixture holds a 46-inch customer facing touchscreen, a mounted UIC credit/debit card acceptor including tap2pay, a headphone jack, a bill acceptor, a fingerprint scanner and a bar code scanner. A kiosk camera sits above the touchscreen while customer facing product shelving sits beneath the touchscreen. The kiosk is ADA compliant. Color options for the rectangular shaped fixture include black, white, chocolate apple, wild apple, linen onyx or hard rock maple. A customer facing header sticker graces the top of the fixture which can be removed or customized.